When it comes to investing in dividend growth stocks, it is critical that you have a plan in place. For example, chasing high yielding stocks may seem like the right strategy to a new investor. When in reality, it is likely going to be a risky strategy to build a portfolio. In order to stay the course and follow a plan, we adopted a strategy years ago on how to select the best dividend stocks. Following these steps over the past 5+ years has helped us build a solid portfolio. But as successful as we have been in building our portfolio, we may have been missing out on some other great stocks. Over the past month, we have started buying shares in 2 new stocks. Neither of the companies we purchased would have met the criteria listed above. Which is why we are adjusting our selection process. Instead of focusing on the current dividend yield and the 10 year DGR (dividend growth rate) … we have shifted to look at shorter term DGR’s. For example, one of the new stocks we just added to our portfolio was Apple Inc. (AAPL). With a current yield of around 2% and only 5 years of paying dividends … this stock would not have made it past our original screen. As you can probably tell, Apple would not have met our minimum dividend yield of 2.5% and it has no 10 Year dividend growth rate. What it does have though is a very low Payout Ratio (27.5%) and a 3 Year DGR of almost 40%! Note – The other recent addition to our portfolio was Cisco Systems (CSCO) which has similar characteristics as Apple but a higher dividend yield and payout ratio. Just to be clear, these 2 new dividend growth stocks make up a very small percentage of our portfolio. For example, our 12 month dividend income for AAPL is currently $5.16 and for CSCO is $2.08. We will likely be adding to both of these positions over the next year, looking for higher dividend growth rates where we can. This doesn’t mean we are abandoning our original screening process … just tweaking the filters to look for more dividend growth in our portfolio. Overall, the majority of our dividend growth portfolio will still come from the first group – moderate dividend growth and yields. These are the “traditional” dividend stocks. Johnson & Johnson (JNJ), Clorox (CLX), and McDonald’s (MCD) all come to mind. Over a year ago, we also decided to add high yielding REIT’s to the portfolio. Realty Income Corporation (O) and Omega Healthcare Investors Inc (OHI) have helped to push our overall yield on cost for the portfolio higher. Finally, the latest group of stocks to join the portfolio will focus on great companies with higher growth rates and lower current yields. These are the future dividend gems out there in waiting. Companies like Apple (AAPL) and Cisco Systems (CSCO) should help our portfolio improve our dividend growth over the years. As dividend growth rates are starting to slow way down for many companies we own, it is time to “tweak” our approach to selecting stocks. Traditional dividend growth companies like those found on the list of dividend aristocrats will still make up the majority of our portfolio. However, we are also focusing on adding other great companies who may not have the long standing track record of raising dividends every year. These companies lack in dividend history like the aristocrats but offer higher dividend growth potential that should help to balance out our portfolio. I believe there is a place for companies like these in our portfolio, as long as we find a good balance of stocks. 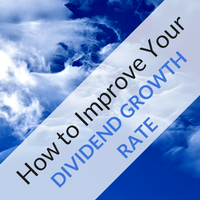 What types of dividend stocks do you focus on buying for your growth portfolio? Or do you prefer a balance of high growth versus higher yield?